Disseminated intravascular coagulation causes thrombotic tendency leading to multiple organ failure and occurs in a wide variety of diseases including malignancy. Disseminated intravascular coagulation is a latent complication in people with prostate cancer. A 51-year-old Japanese man with advanced castration-resistant prostate cancer was admitted to our hospital because of extensive purpura and severe anemia. Prolonged plasma coagulation time, hypofibrinogenemia and normal platelet count suggested that a decrease in fibrinogen induced a bleeding tendency causing purpura. However, elevated plasma levels of thrombin-antithrombin complex, fibrin and/or fibrinogen degradation products and D-dimers, with positive fibrin monomer test, manifested disseminated intravascular coagulation and subsequent fibrinolysis. Plasma levels of thrombin-antithrombin complex, fibrin and/or fibrinogen degradation products and D-dimers decreased after administration of low-molecular-weight heparin. However, low fibrinogen and α2-antiplasmin levels were not improved and plasmin-antiplasmin complex did not decrease, which revealed excessive fibrinolysis complicated with disseminated intravascular coagulation. We suspected that prostate cancer cell-derived urokinase-type plasminogen activator caused excessive fibrinolysis. Administration of tranexamic acid for fibrinogenolysis was added together with high-dose anti-androgen therapy (fosfestrol) for prostate cancer. Thereafter, prostate-specific antigen and plasmin-antiplasmin complex decreased, followed by normalized fibrinogen and α2-antiplasmin levels, and the patient eventually recovered from the bleeding tendency. Immunohistochemical staining of the biopsied prostate tissue exhibited that the prostate cancer cells produced tissue factor, the coagulation initiator, and urokinase-type plasminogen activator. This patient with rare complications of disseminated intravascular coagulation and excessive fibrinolysis is a warning case of potential coagulation disorder onset in patients with prostate cancer. We propose that combined administration of tranexamic acid and low-molecular-weight heparin together with high-dose anti-androgen therapy is a useful therapeutic option for patients with this complicated coagulation disorder. One of the lethal complications of patients with solid tumors is disseminated intravascular coagulation (DIC) in which microthrombi are formed by abnormal activation of the coagulation system. Although consumption of coagulation factors and activation of the fibrinolytic system are always observed, severe bleeding tendency and excessive fibrinolysis are rare in DIC. In prostate cancer (PC), the incidence of DIC complication is from 13% to 30% whereas that of bleeding symptoms is only 0.40% to 1.65%. PC cells express tissue factor (TF) that initiates the extrinsic coagulation pathway and leads to DIC. Moreover, PC cells produce urokinase-type plasminogen activator (uPA) that converts plasminogen to plasmin: a fibrinolytic protease. TF is the causative of DIC that is reported to be a sign of metastatic PC. TF and uPA are associated with PC metastasis and angiogenesis as negative prognostic factors[2, 8, 9]. Thus, it is possible that PC cells induce simultaneously DIC by TF and fibrinolysis by uPA in the patient, especially at the advanced stage. Little attention has been paid to the potential pathogenicity of PC cells, particularly in fibrinolysis. In this paper, we report a patient with metastatic PC who showed a severe bleeding tendency with hypofibrinogenemia by excessive fibrinolysis accompanied by DIC. To elucidate the pathophysiology of the coagulation disorder, we analyzed values of coagulation and fibrinolysis markers and examined the biopsied PC tissue for TF and uPA production. Furthermore, we propose an atypical (unusual) but appropriate treatment for such a patient. A 51-year-old Japanese man who had advanced castration-resistant PC was admitted to our hospital because of extensive purpura and severe anemia. Although his platelet count was within the reference range and plasma clotting time was slightly prolonged, the fibrinogen level was low. Plasma levels of thrombin-antithrombin complex (TAT), fibrin and/or fibrinogen degradation products (FDPs), D-dimers and plasmin-antiplasmin complex (PAP) were high. Plasma α2-antiplasmin (α2-AP) level was low and a fibrin monomer test was positive (Table1). These data indicated that he had DIC. Plasma TAT, FDPs, and D-dimers decreased (Figure1) and platelet count increased after administration of low-molecular-weight heparin (LMWH). However, fibrinogen and α2-AP did not increase and PAP did not decrease (Figure1). Bleeding diathesis continued whereas DIC parameters were improved by the treatment. To inhibit activation of fibrinolysis, administration of tranexamic acid was started together with LMWH. Then, PAP level decreased and levels of α2-AP and fibrinogen increased. Bleeding tendency disappeared. High-dose anti-androgen therapy (fosfestrol) for PC was also performed on day 20 for PC. Prostate-specific antigen level decreased to 482.4ng/mL. APTT activated partial thromboplastin time, FDPs fibrin and/or fibrinogen degradation products LMWH low-molecular-weight heparin, PAP plasmin-antiplasmin complex, PSA prostate-specific antigen, TAT thrombin-antithrombin complex. Clinical course of the patient. α2-AP: α2-antiplasmin; FDP: fibrin and/or fibrinogen degradation product; LMWH: low-molecular-weight heparin; PAP: plasmin-α2-antiplasmin complex; TAT: thrombin-antithrombin complex; TX: tranexamic acid. Open square: TAT; open circle: FDP; closed triangle: D-dimer; open diamonds: PAP; closed circle: fibrinogen; closed square: α2-AP. To investigate a correlation of coagulation and fibrinolysis markers, we analyzed the values of 31 plasma samples obtained during the 90-day hospitalization. As shown in Figure2, the patient’s fibrinogen level correlated with levels of α2-AP (r2=0.7811, P<0.0001) and PAP (r2=0.5394, P<0.0001), and D-dimer/FDP ratio (r2=0.6473, P<0.0001). There was no correlation between levels of fibrinogen and TAT. The level of α2-AP (r2=0.7060, P<0.0001) correlated positively with D-dimer/FDP ratio and negatively with PAP level (r2=0.5549, P<0.0001). The prostate tissue biopsied for the initial diagnosis was immunostained using monoclonal antibodies specific for human TF or uPA (Fuji chemical, Toyama, Japan). This analysis revealed that the cancer cells were positive for both TF and uPA (Figure3). 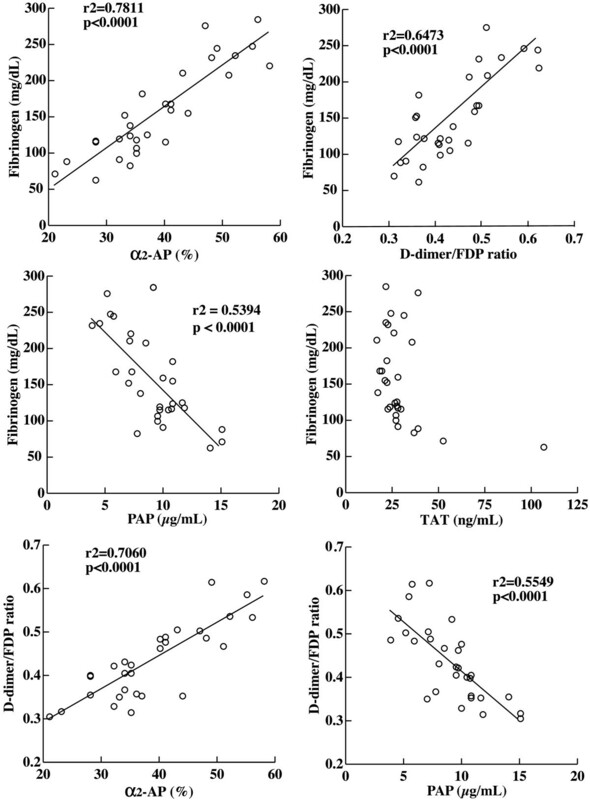 Relationship between levels of fibrinogen, α 2 -antiplasmin, D-dimers/FDP ratio, thrombin-antithrombin complex, and plasmin-antiplasmin complex. Pearson correlation coefficients (r) were used to determine the associations between the coagulation markers. α2-AP: α2-antiplasmin; FDP: fibrin and/or fibrinogen degradation product; PAP: plasmin-α2-antiplasmin complex; TAT: thrombin-antithrombin complex. Immunohistochemical staining for tissue factor (A, magnification ×200) or urokinase-type plasminogen activator (B, magnification ×100). Arrows indicate positive cancer cells. We present a patient with PC who had a bleeding tendency of which the first sign was purpura. DIC is initiated by TF with factor VIIa that activates the extrinsic coagulation pathway. TF is positive in more than 70% of human PCs and increase of TF in patients’ plasma is associated with patient poor prognosis. The TF expression in the PC cells of this patient (Figure3) suggests DIC induction by the cancer-derived TF. Coagulation activation results in fibrinogen consumption to some extent but the severe hypofibrinogenemia seen in the present case is unusual in DIC. This was supported by no correlation between fibrinogen and TAT levels (Figure2). By LMWH administration, levels of FDP, D-dimer and TAT decreased but the fibrinogen level was not improved (Figure1). These results indicated that hypofibrinogenemia was not induced by DIC alone. Under normal conditions, plasmin degrades only stable fibrin (cross-linked fibrin) and is immediately inhibited by α2-AP in circulation. If the plasma α2-AP level is below 60% of the normal level, α2-AP is unable to control plasmin sufficiently, thus plasmin also degrades fibrinogen, fibrin monomers and unstable fibrin in addition to stable fibrin. The high PAP and low α2-AP levels at the hospitalization day 1 (Figure1) indicated consumption of α2-AP by forming complexes with increased plasmin. Plasmin generates D-dimers only from stable fibrin, whereas FDP derives from either fibrinogen or any forms of fibrin. Accordingly, the decrease in D-dimers/FDP ratio indicated a relative increase in fibrinogenolysis that could lead to hypofibrinogenemia. By the treatment with tranexamic acid, the low fibrinogen level elevated in correlation to the increase in D-dimers/FDP ratio and α2-AP level and to the decrease in PAP level. It is probable that the severe hypofibrinogenemia in this patient was caused by fibrinogenolysis due to excess plasmin production. The low plasma α2-AP level and high plasma PAP level agreed with the fibrinogenolysis observed in a patient with metastatic PC. Bleeding diathesis of this patient was improved by administration of tranexamic acid in relation to elevation of α2-AP level, suggesting that excessive fibrinolysis induced bleeding diathesis. Platelet and coagulation factors, such as factor VIII and IX, are important in normal hemostasis. From data that the platelet count was within the normal range and clotting time was slightly prolonged, it is unlikely that bleeding diathesis was caused by thrombocytopenia or consumption of coagulation factors. The result that fibrinolysis activation was not improved by anticoagulation therapy alone, suggests an involvement of the primary fibrinolysis, at least partially, in the bleeding diathesis. The plasma uPA level was not measured, but uPA expressed in PC cells probably contributed to excessive fibrinolysis. Unfractioned heparin has been used for treating patients with DIC complicated with cancer and shown to prolong their survival. Tranexamic acid inhibits plasminogen activation, thereby causing thrombotic tendency in typical DIC cases, therefore, this agent is usually contraindicative for DIC patients. However, in this case, together with LMWH for DIC, we administered tranexamic acid to the patient who manifested excessive fibrinolysis, and successfully controlled the complicated coagulation disorder. In such a case, tranexamic acid is potentially available for treatment of excessive fibrinolysis. A PC cell itself may often be overlooked as a causative of coagulation disorder because of the very low incidence of overt DIC in PC. Even if a clinician notices DIC in such a patient, he or she may erroneously consider that any changes of coagulation markers are caused solely by DIC. Accordingly, such a patient may receive only heparin infusion, which would not adequately meet the patient’s bleeding tendency accompanied by excessive fibrinolysis induced by uPA secreted from PC cells. Although it is widely known that uPA plays important roles in PC cell invasion and proliferation[9, 15], the classical aspect of uPA as an activator of the fibrinolytic system may paradoxically not be easily conceivable in patients with PC with bleeding disorder. Therefore, it is important to bear in mind that PC cell uPA can generate plasmin that degrades fibrinogen, leading to hypofibrinogenemia and resultant bleeding tendency. The present case of a rare complication of excessive fibrinolysis raises awareness of a potential fibrinolytic system being activated in patients with PC. Hence, we hereby propose the treatment of combined administration of tranexamic acid and LMWH together with high-dose anti-androgen therapy for a patient with PC with fibrinolysis coincident with DIC. We thank Ms Tatsuko Kubo for her technical assistance in immunohistochemical staining. YW, NK, WT, KT, JH, YM and YM examined and treated the patient with PC. MU, YK and ME analyzed and interpreted the patient’s data. TI performed immunohistochemistry and supervised this report including manuscript revision. All authors read and approved the manuscript.